Today I will take one more step in my goal of covering all the nations of Europe. 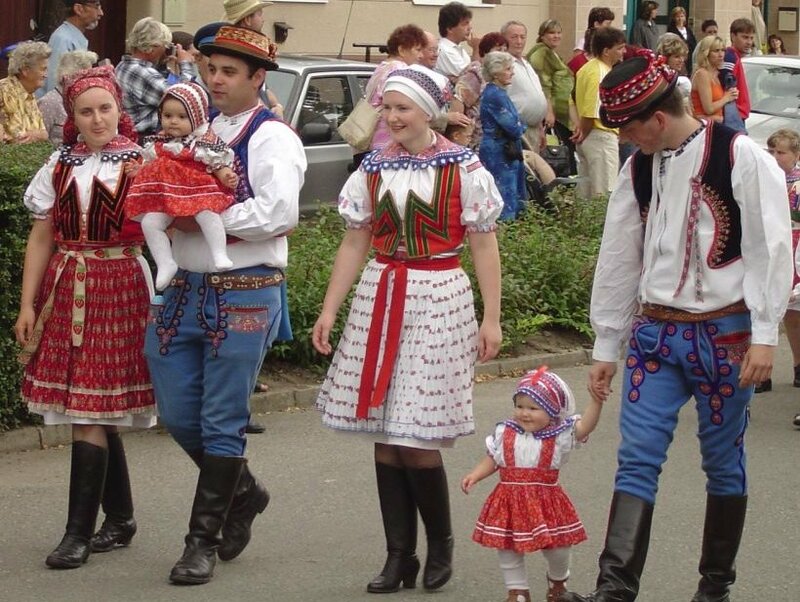 The Czech Republic has two main divisions, Bohemia and Moravia, each of which is defined as a river basin. 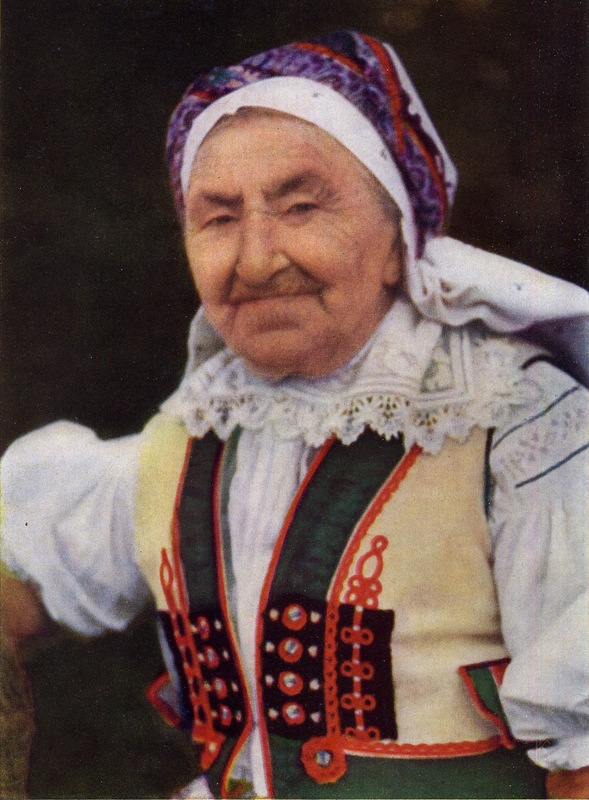 Moravia is the basin of the Morava river [not to be confused with the Morava river of Serbia]. Slovácko is a cultural region in the southeast of Moravia. It is not recognized politically, the current political divisions having nothing to do with traditional cultural divisions, as is so often the case. 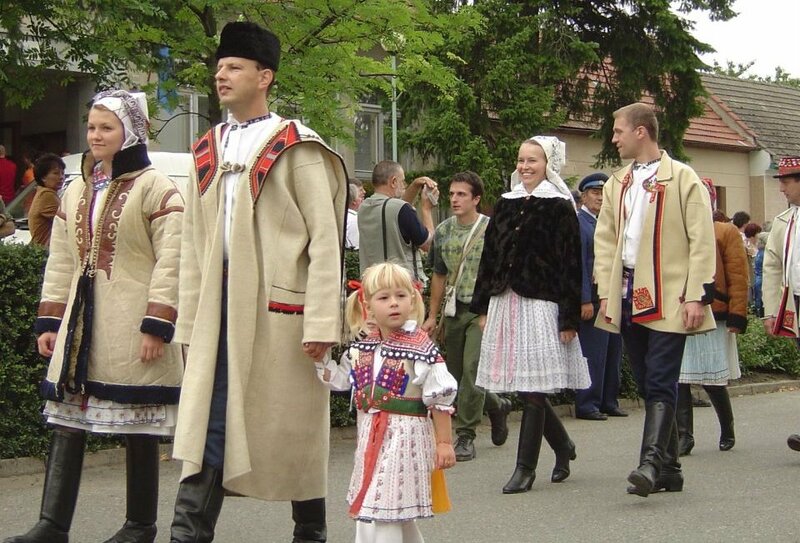 In English it is usually referred to as Moravian Slovakia. 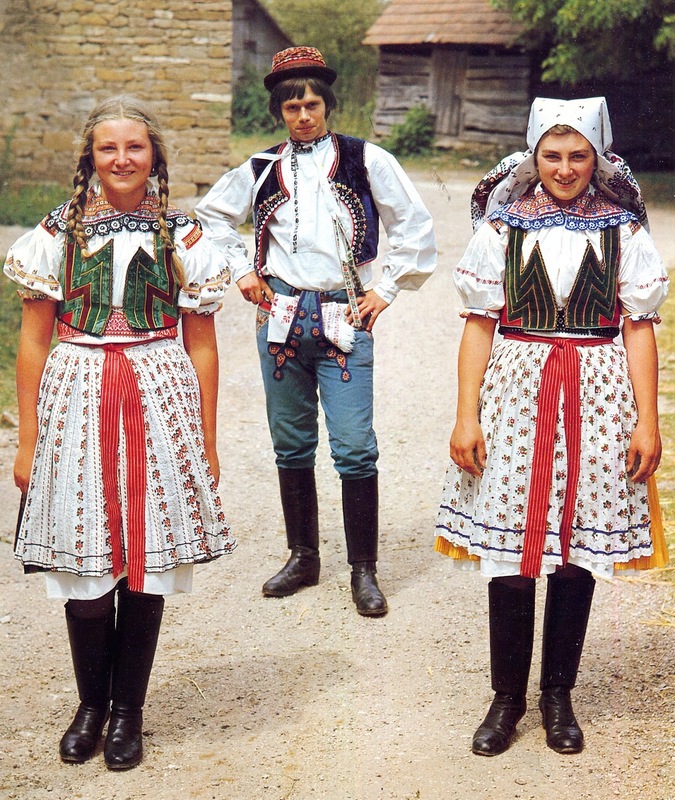 The local dialect and much of the folklore is transitional with those of Slovakia. The center of this region is Uherské Hradiště. Slovácko has the most colorful and elaborate costumes in the entire Czech Republic, in part due to limited Protestant influence. 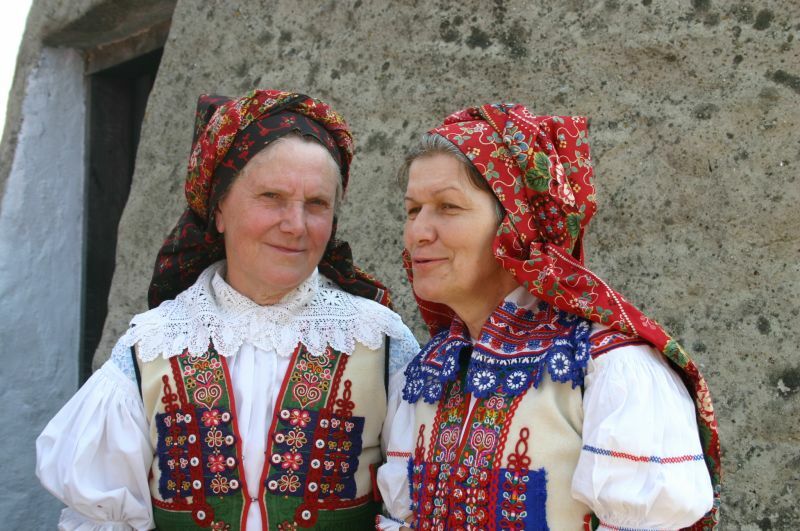 Moreover, the folk costume tradition here is still very much alive. 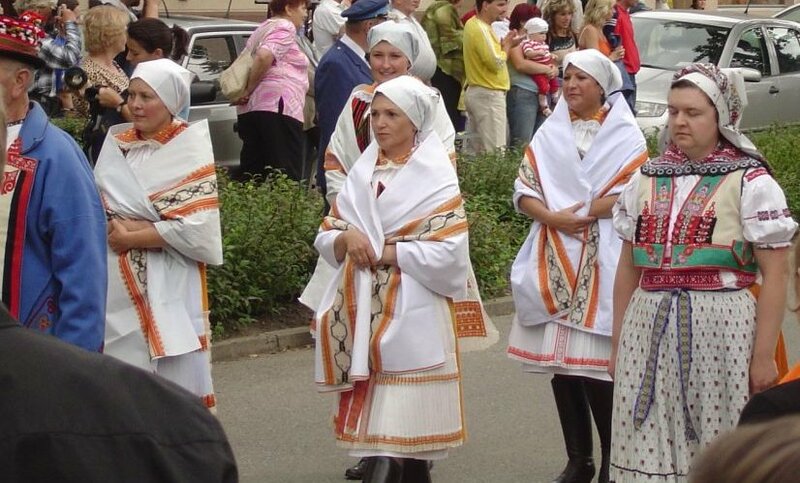 There are 29 distinct costumes in this region, which form 8 groups, one of which I will cover today. 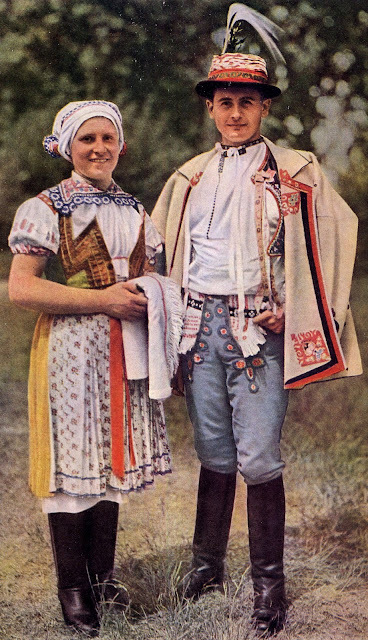 Horňácko is one of these 8 microregions, being found in the White Carpathians, the westernmost part of the Carpathian range.. At first glace, the costume may not seem to be typical of the area, but Horňácko has preserved an older form of the costume, and has not participated in some of the irrational exuberance which characterizes some of the others. 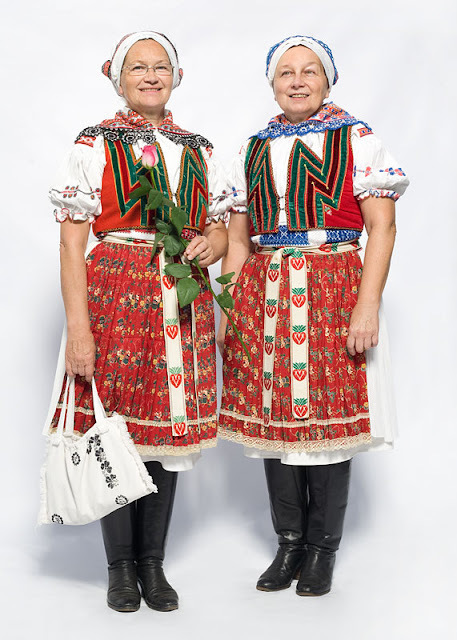 Some of the other microregions preserve memories of older costumes which more closely resemble that of Horňácko than their contemporary versions do. Velká nad Veličkou is the main municipality of this microregion. Javornik is another well known municipality. 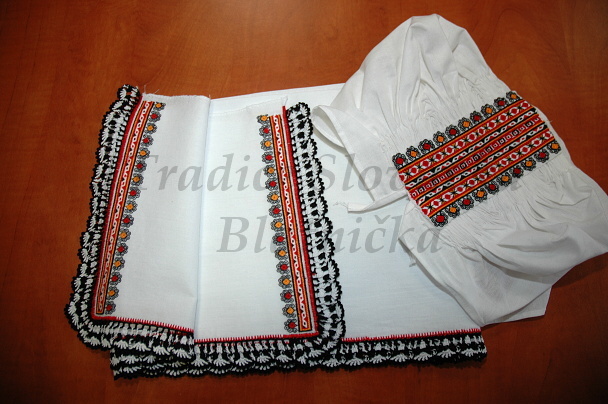 The base garment, which i believe is found throughout Slovácko, is called rubáč. This resembles a slip. Here is the cut. In some of the other regions this garment does not show when fully clothed. In Horňácko the waist has a woven ornament which remains visible even when fully clothed. 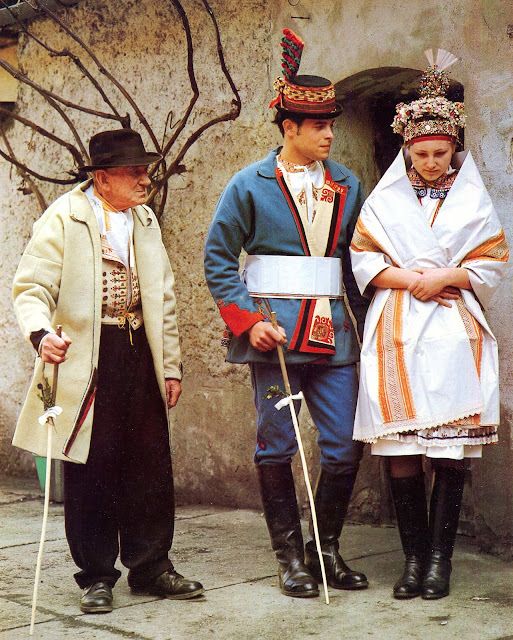 Here is a girl wearing the rubáč and her boots. 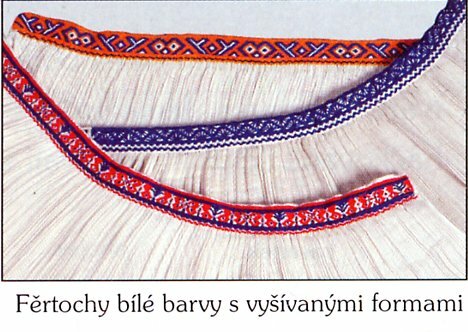 The woven ornament is in black, blue, red, or some combination. Here are some typical designs. One of my readers asked why the girls were all wearing trousers. They are not. The typical footwear consists of high boots. Those for men and women are very similar. The womens' boots have a higher heel and a more dainty shape [and are generally smaller], The uppers are of soft leather and often have stitched ornament. The legs are hard leather, but the womens' have a soft edge at the very top. Over the chemise a short blouse is worn. 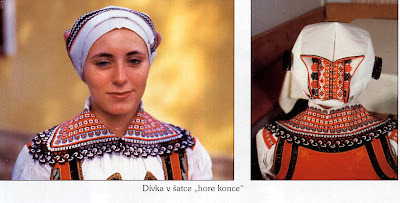 This is called rukávce, which literally means 'sleeves'. This basic idea is also found in parts of Sweden, Finland, Estonia, Russia and other places. It has a large square fold down collar and short sleeves which are both typical of this region. It does not cover the midriff. The sleeves are full, but not excessively so. 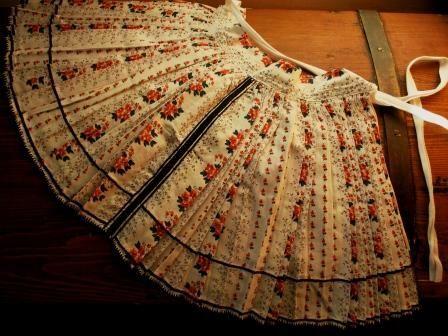 The sleeves extend to the neckline, they are smock-gathered on the shoulder, and a band of embroidery is done either directly on the gathers or on a strip of cloth sewn on top of them. 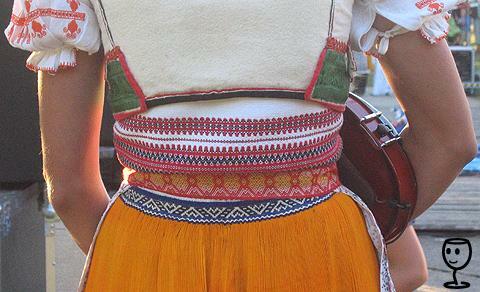 there is usually another band of embroidery halfway down the sleeve as well. 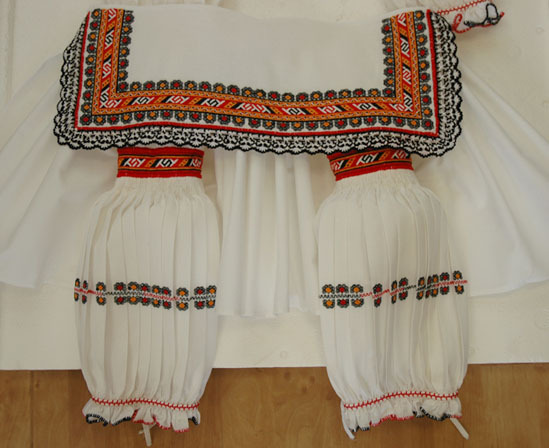 The sleeves are finished with homemade lace, and the collar also has embroidery and lace on three sides. 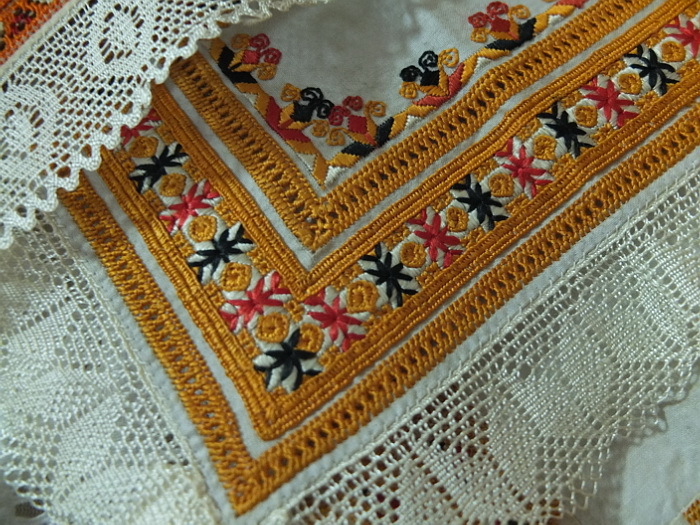 There is some variety as to colors and styles of embroidery used. This following piece is from the collection of Jan Letowski of the online store EasternEuropeanArt. You may find this and other items for sale there. 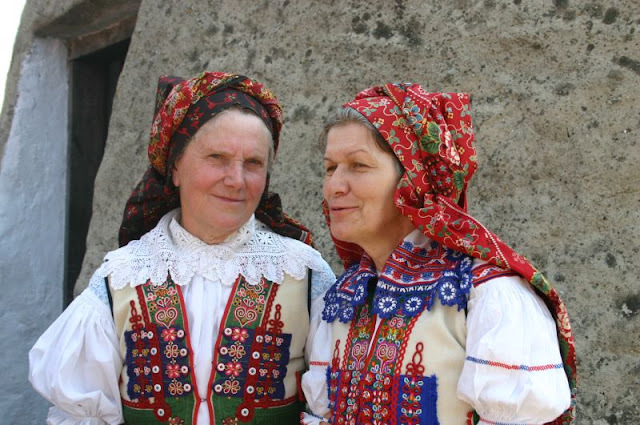 He travels to Europe and obtains very good quality folk costumes. 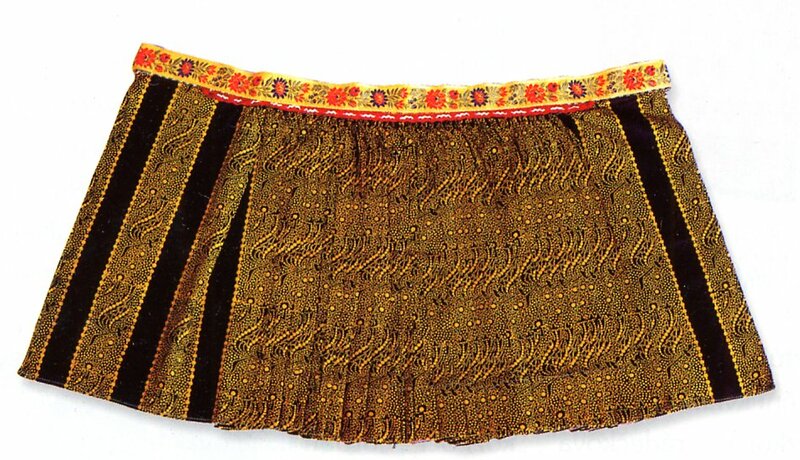 This, along with the traditional headdress, is the main focus of embroidery for this costume. Over the chemise are worn two aprons, front and back which are about 5 cm shorter. 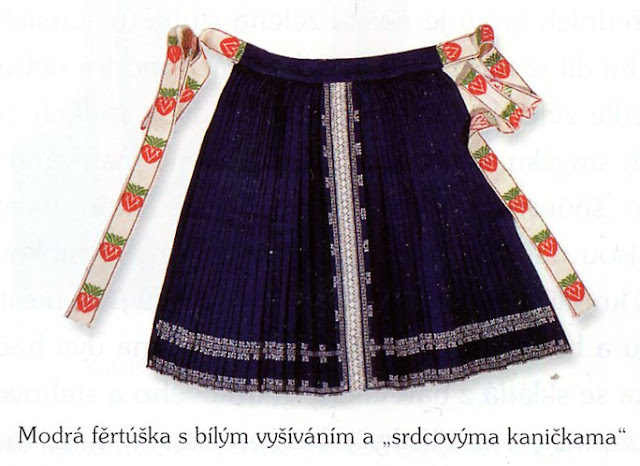 The back apron is called fěrtoch and comes in two forms. 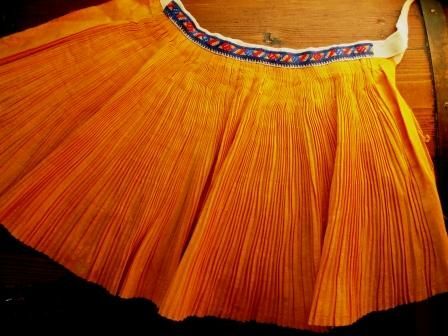 The dress version is either white or a golden yellow color, and is crimp pleated with an embroidered edge. The everyday version is made of printed cloth, is knife-pleated, and has a ribbon sewn on as a waistband and ties. 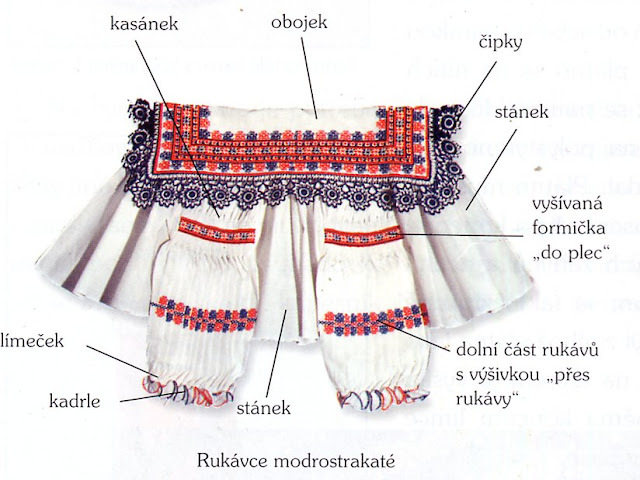 This is called sukňa. The front apron is called fěrtuška. 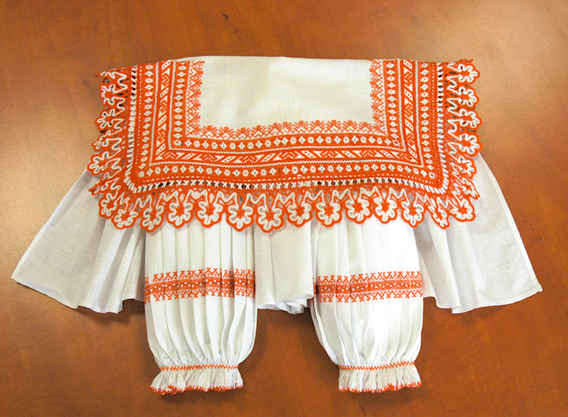 It is usually made of two panels of printed cloth and can be of various colors. 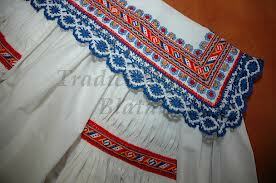 It is pleated, trimmed with lace, and is sewn onto a ribbon which wraps around the waist and is tied in front. 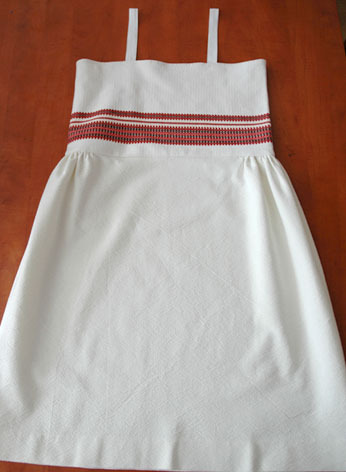 Sometimes for ceremonial occasions the apron is of dark or white cloth with embroidery. 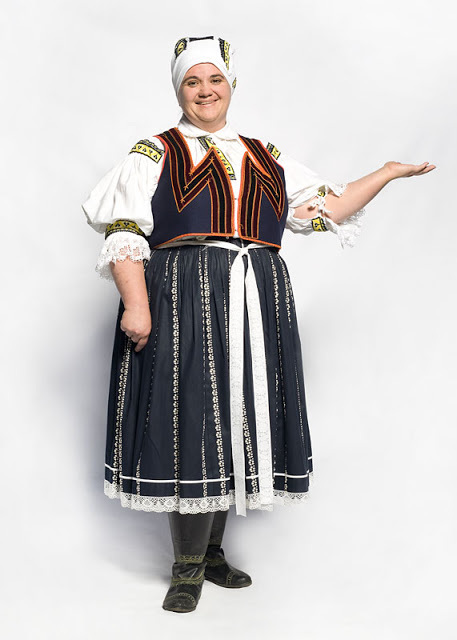 There are two types of vest which may be worn with this costume. Both leave the midriff uncovered. The simpler of the two is called kabatek. 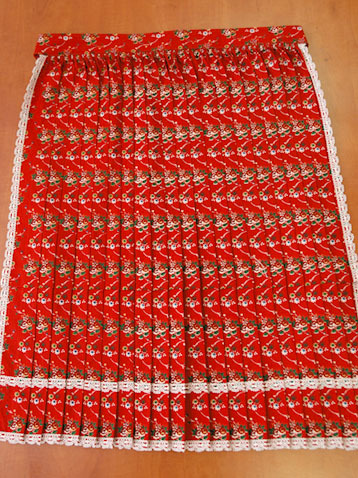 It is sewn of red or blue wool, damask or brocade and trimmed with ribbons and cording. 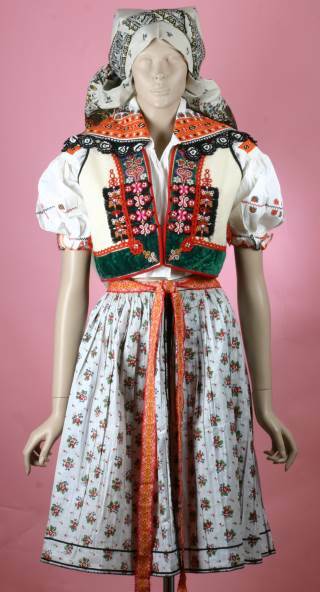 It has a point on each side of the front, reminiscent of costumes from the Spisz region. The more elaborate one is called kordula. It is sewn of white wool, with wide green or blue ribbon applique, as well as wool cording and embroidery. This first example is also from the collection of Jan Letovsky. 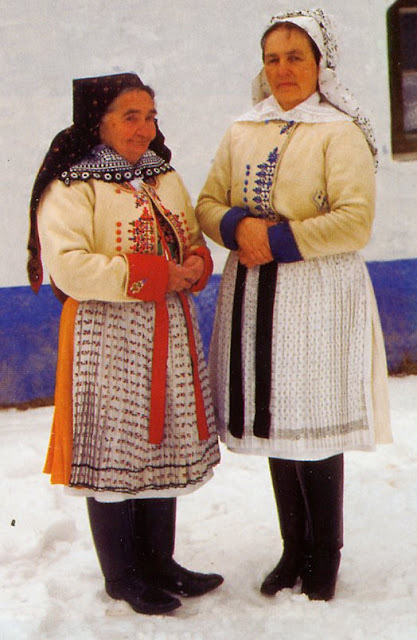 There is a jacket similar to this but with sleeves called lajbl which is worn in cooler weather and by older women. There are various outer garments which are worn at need. 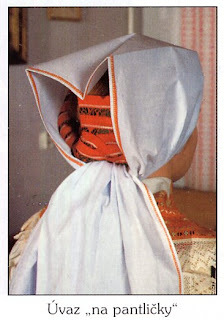 The head coverings come in two forms. 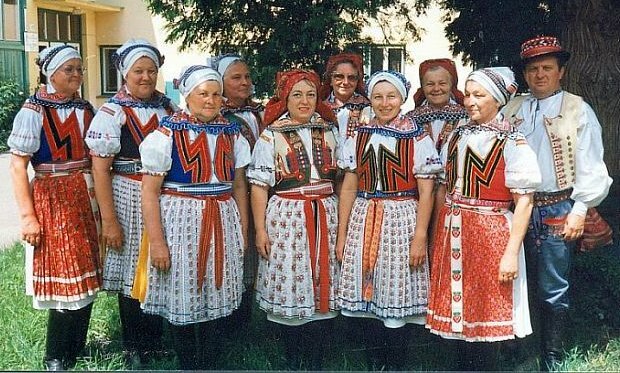 The newer is called Šátek. This is a large kerchief tied over the head in two different ways. 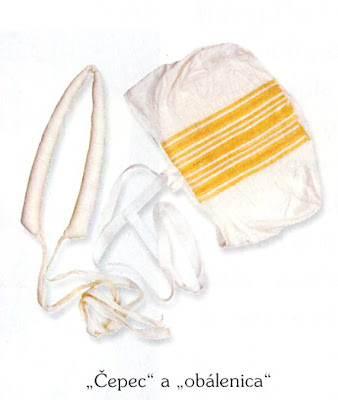 The square shape is held by starch and by a newspaper form inside the kerchief. They come in various colors and patterns. 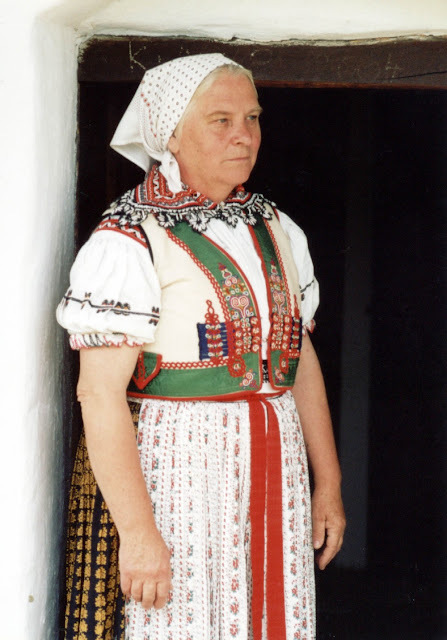 The older and far more traditional type is called Šátka. 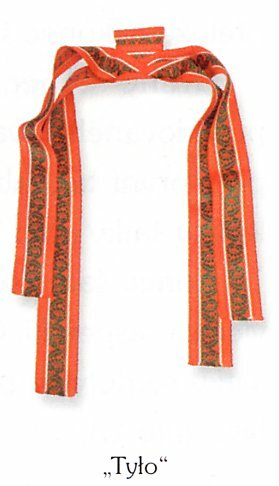 This is a long narrow piece of linen embroidered on the ends, similar to the Ukrainian peremitka and other headpieces used in many places in Eastern Europe. 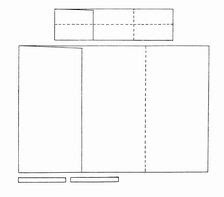 This also has two variants, 'with corners up', and 'with corners down'. Single girls start by wrapping their braids with a paired ribbon called Tylo. 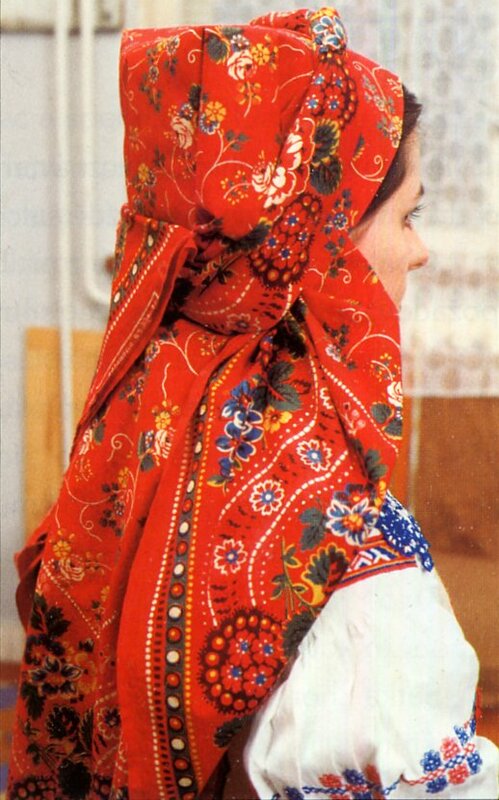 Married women, of course, are supposed to keep their hair covered. 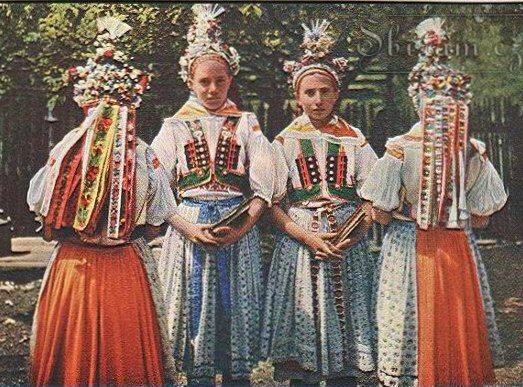 They first secure their braids with a band called obalenica [on the left], and then tie on a highly embroidered cap called Čepec. 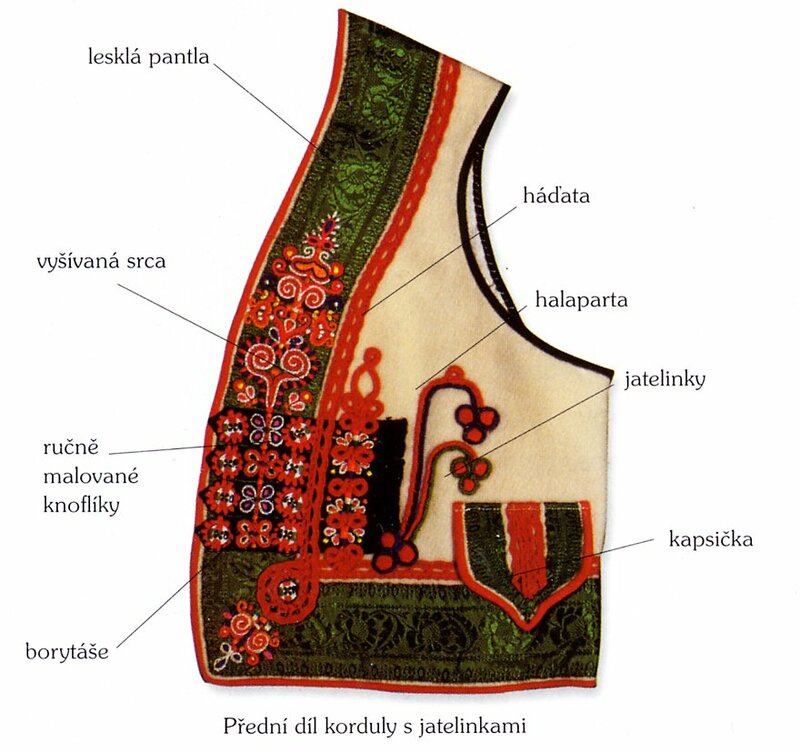 The embroidery on the cap, the blouse, the apron and the Šátka are carefully coordinated. Different colors of embroidery are considered appropriate for different occasions; golden yellow embroidery is considered especially formal. 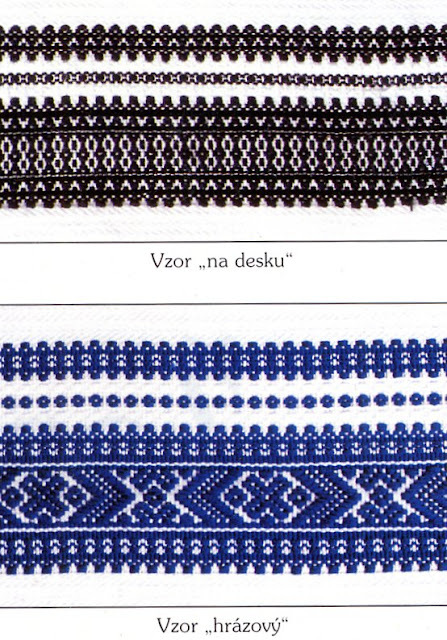 The Šátka to be worn 'with corners down' is longer, wider, has more embroidery and is pieced and edged with lace. It is considered more formal. 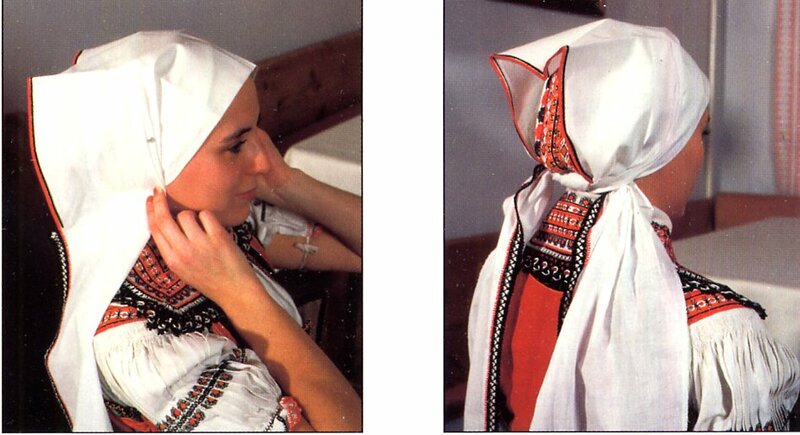 It is placed on the head, a few folds are made at the cheek, tied behind the neck, and both ends are spread out. The Šátka to be worn 'with corners up' is shorter and narrower on the ends, and has less embroidery. After it is tied behind the neck, the ends are folded lengthwise, then wrapped around the top of the head and tucked in. 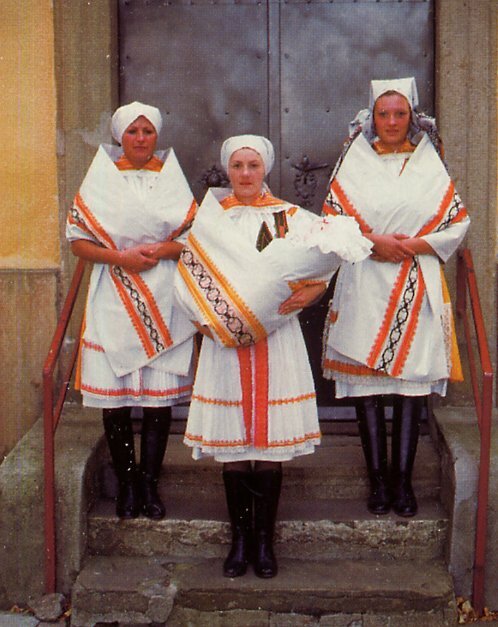 For the most important ceremonies such as Confirmation and Weddings, an elaborate wreath is worn by girls. 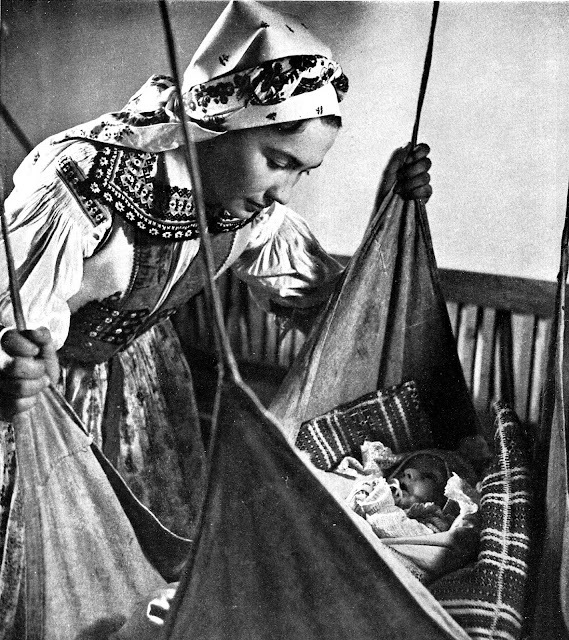 The wreath is never worn again once married, but the embroidered shawl is used for other ceremonies, such as baptism and the Churching of the mother and child after 40 days. There are many small variations which are considered appropriate for various occasions. I hope that you have found this interesting. 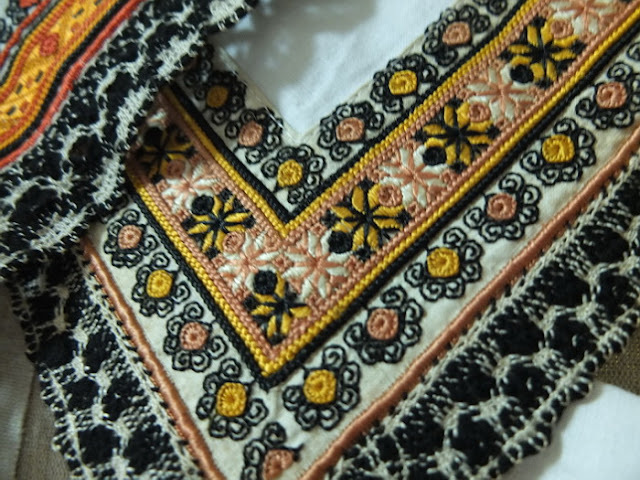 The embroidery of this region is rich and very beautiful, and would make for interesting projects. 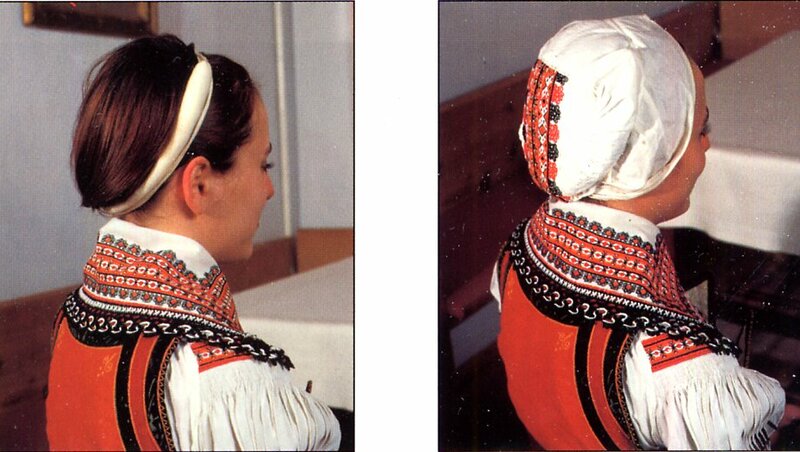 I will close with some more images of this costume and embroidery. Here is a video of some girls singing. This is one of the slow sweet songs which are so beloved by the Moravians. You have a good view of their outfits. 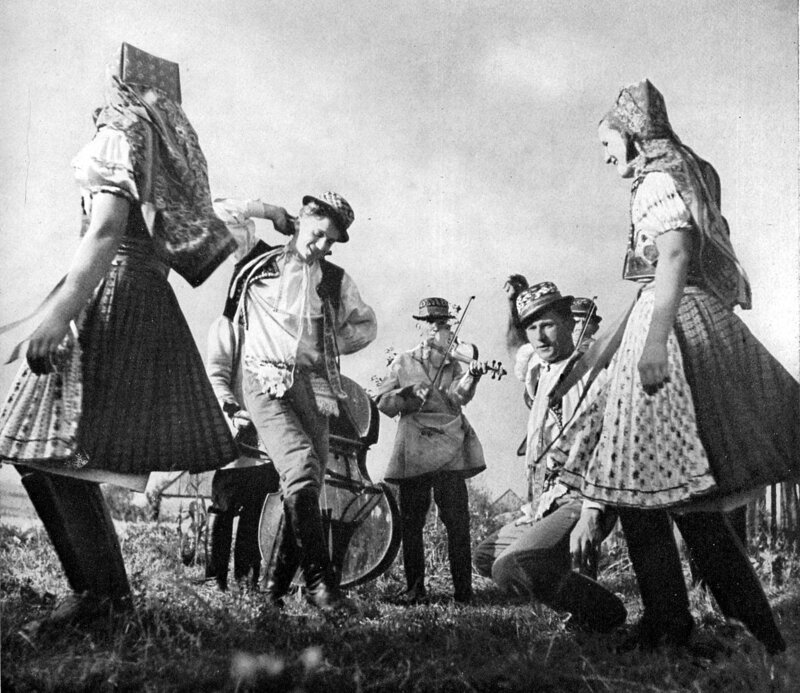 A couple dance from this region. This seems to be midway between Goral dance and Csardas. Another couple dance by the same group. 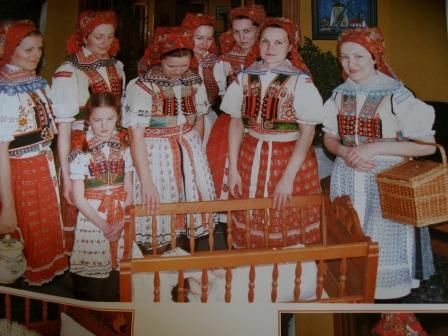 In this one the girls are all wearing the everyday version of the back apron. 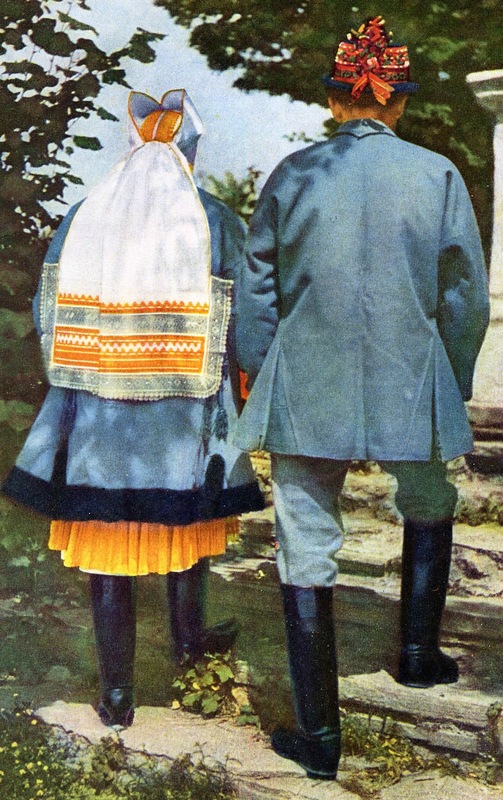 They are also wearing knee socks and kiepce [moccasins], instead of boots. Here is the home page of Jan Letowski's online store including links to his Ebay offerings. The women all seem to be wearing some type of trousers. 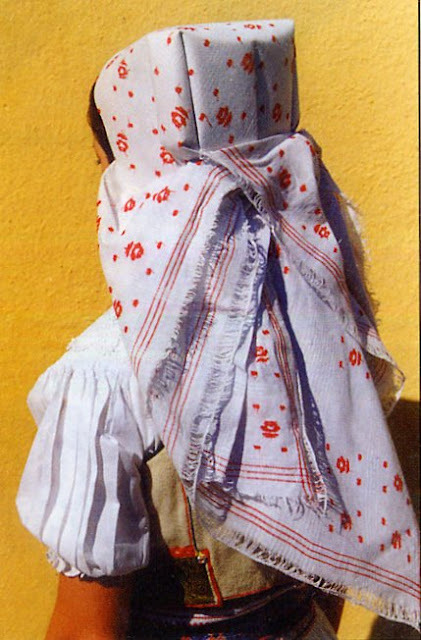 Or is that garment meant to be similar to pantaloons in the 19th century western European fashion? I don't see any trousers at all. 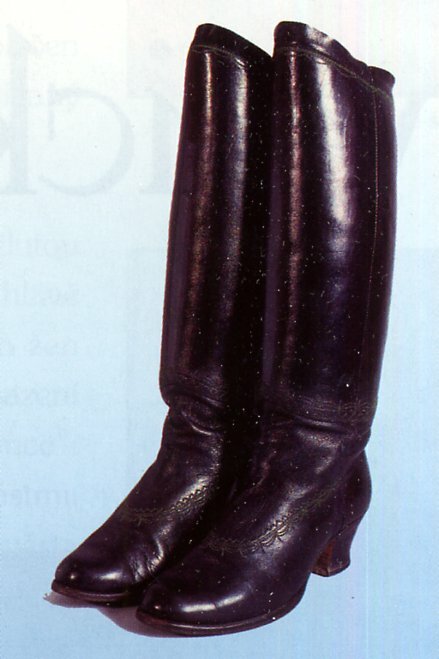 They wear tall boots, very similar to the mens'. The top of the boots comes to about the same level as the hem of the rubac, but in some of the images you can see the knees. 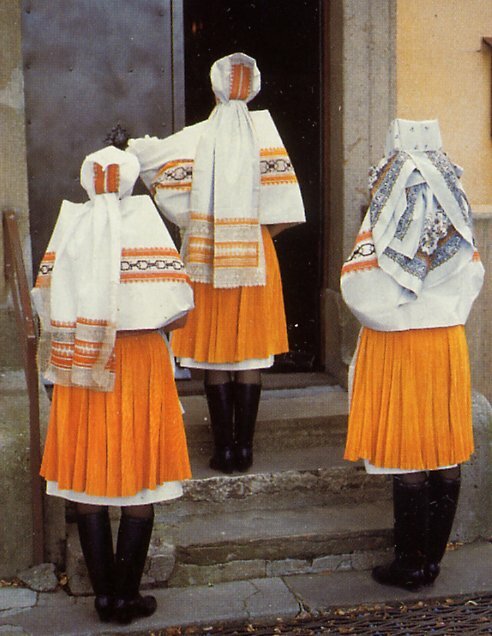 It looks like they might be wearing tights, but that is a modern addition. Third Czech, Moravian and Slovak Folklore Festival in San Diego! 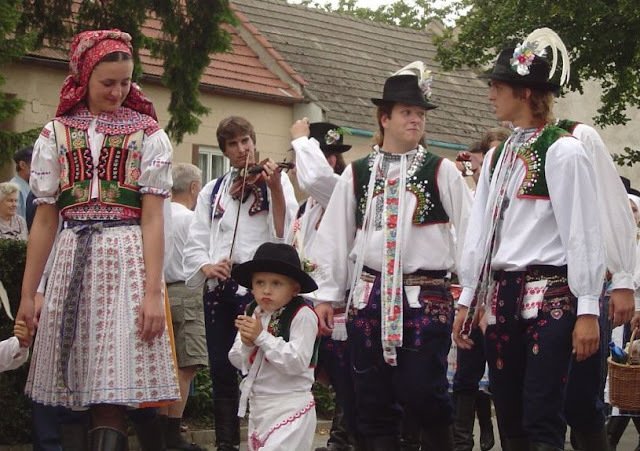 What a beautiful evening with singers, dancers and musicians dressed in folklore costumes as they enjoy Czech, Moravian and Slovak traditional music, food, Burčák and many more. Thanks so much to everyone who came down last night and made a night to remember! Some observations: "šátek" is actually the general Czech word for kerchief/bandana, usually applied to square pieces of cloth. 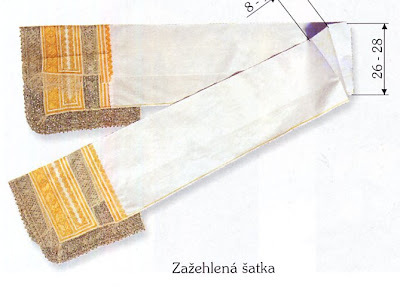 The longish piece of cloth is "śatka", with no long vowels - notice it's written that way in your illustrations! 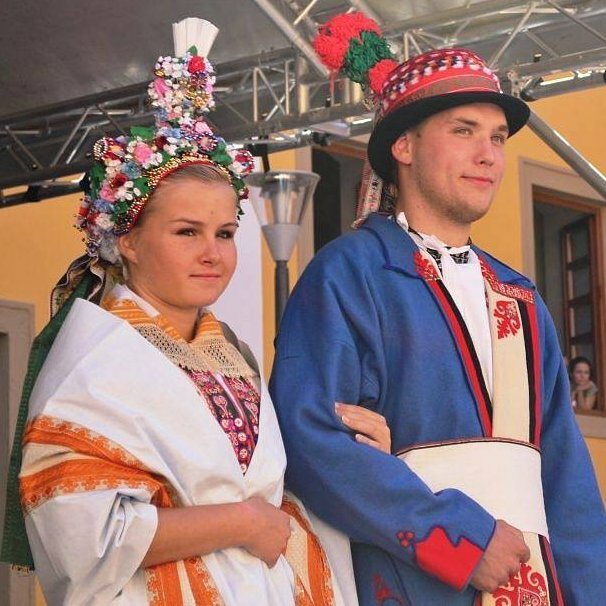 Many of these principles (and names) apply to other regions as well, at least in Moravia. E.g. 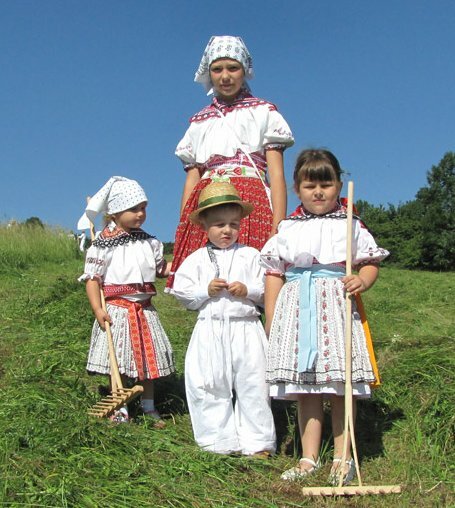 Moravian Wallachia (one side of my family comes from there, so I've been looking up information): rubáč would be plain, often of two kinds of cloth, one of which might be hemp. 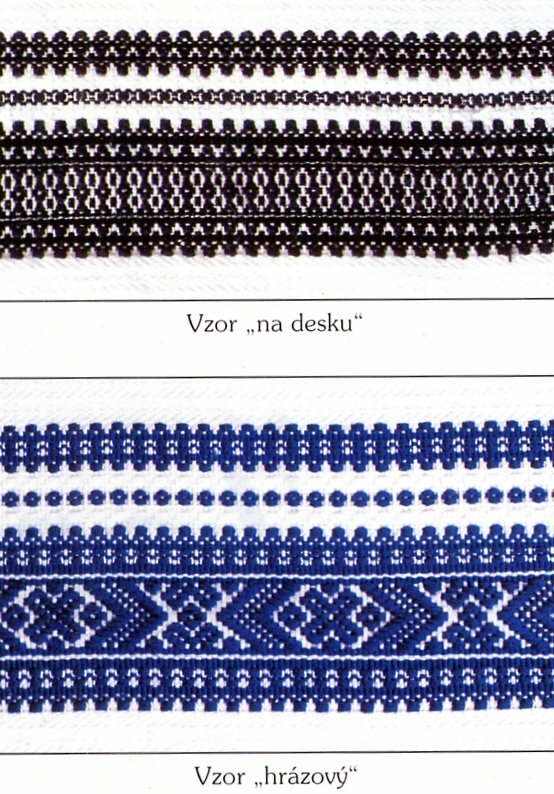 Rukávce would be sewn into slightly different shapes, but on the same construction principles (usually with a standing collar rather than this shape here). Šatka was worn even there, as well as white kerchiefs, to be replaced by red printed ones later on, they just seem to have been tied on in a much simpler manner. 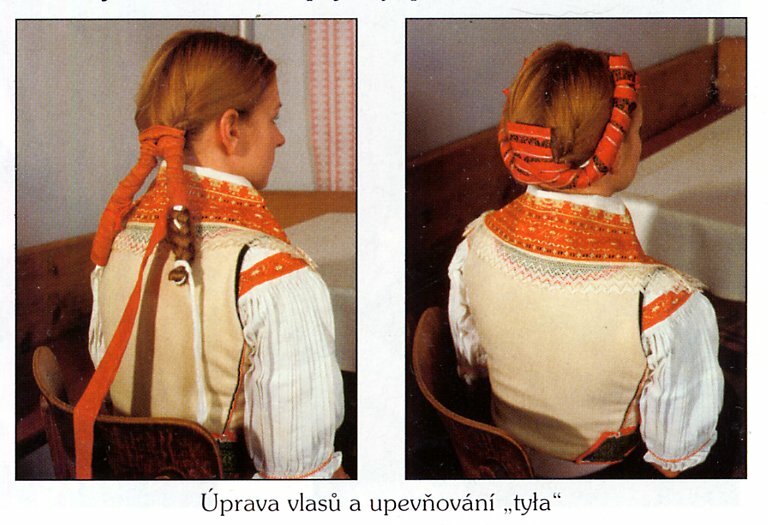 Kordula/kordulka - different styles, but the same principle and basic shape. 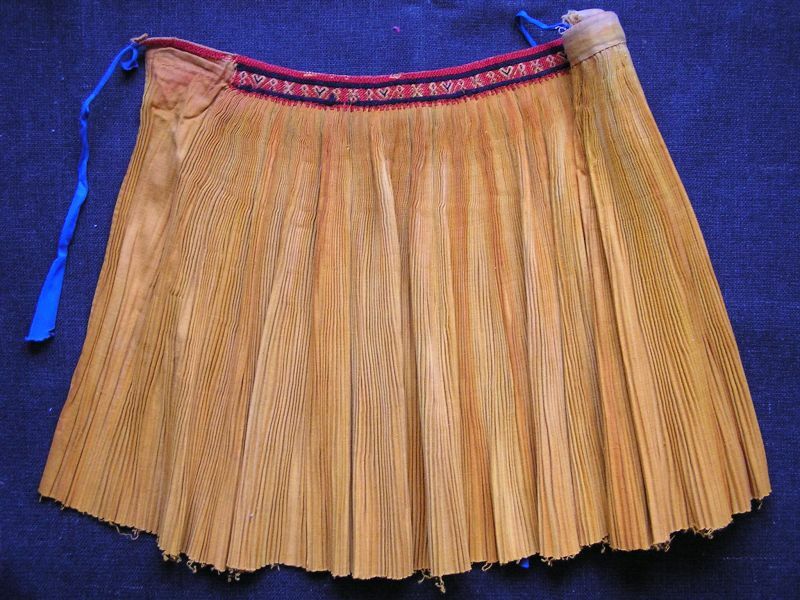 At least in some places and at some point in time, the apron-skirt combination would have also been similar, though made from different fabrics.